Oban is at the west end of the A85 highway, running east to Perth, and connects to the northeast via the A828 to the A82 running through Fort William and on up the Great Glen to Inverness on the North Sea coast. There is frequent bus service northwest to Fort William, connecting beyond there to Inverness and other destinations, and bus service south as far as Glasgow. Oban is the terminus of a rail line from Glasgow. There are about three trains in each direction every day between Oban and Glasgow. But the distinctive transport of Oban is its frequent ferry service connecting the west coast of Scotland to the Inner and Outer Hebrides. Caledonian MacBrayne is the major ferry operator, and Oban is their busiest terminal. 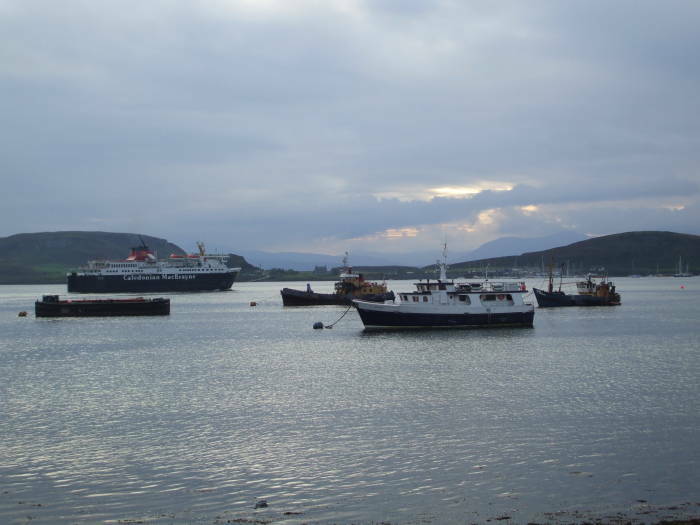 Here you see a Caledonian MacBrayne ferry leaving Oban harbor in the evening, bound for Craignure on Mull and beyond. That's the island of Kerrera directly across from Oban harbor, and in the distance between the two hills of Kerrera you can see the island of Mull in the distance. 1: Ferry from Oban to Craignure, on Mull. 2: Bus across Mull from Craignure to Fionnphort. 3: Very short ferry crossing from Fionnphort to Iona. Caledonian MacBrayne promotes a package, a combination ticket including all three stages in both directions on one day. But I found that I could simply buy each ticket as I went (day return for Oban-Craignure, singles for the other links) for a total of only about 60% the price of the package! 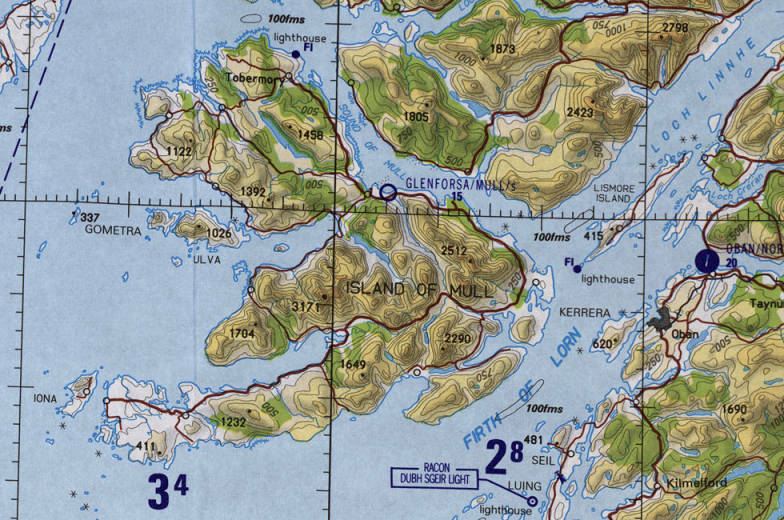 U.S. government aeronautical chart TPC D-2C showing Iona, Mull, and Oban. The ferry crosses the Firth of Lorn and the open end of Loch Linnhe. 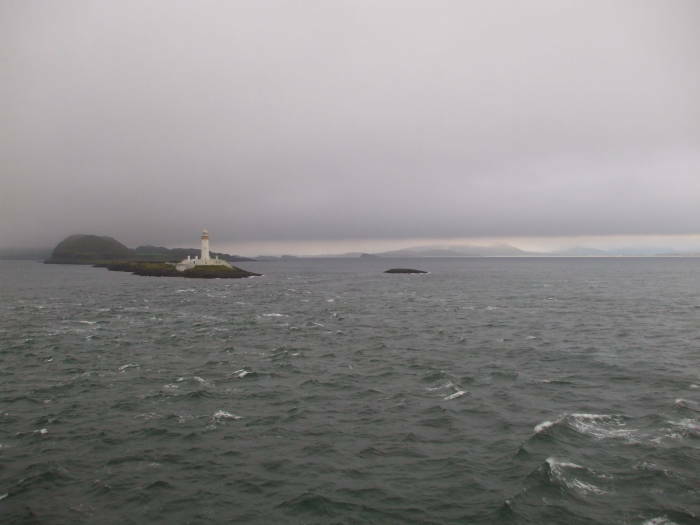 Here's we're passing the lighthouse on Eilean Musdile off the southern tip of the Isle of Lismore. Duart Castle is at the southeast tip of the Isle of Mull. 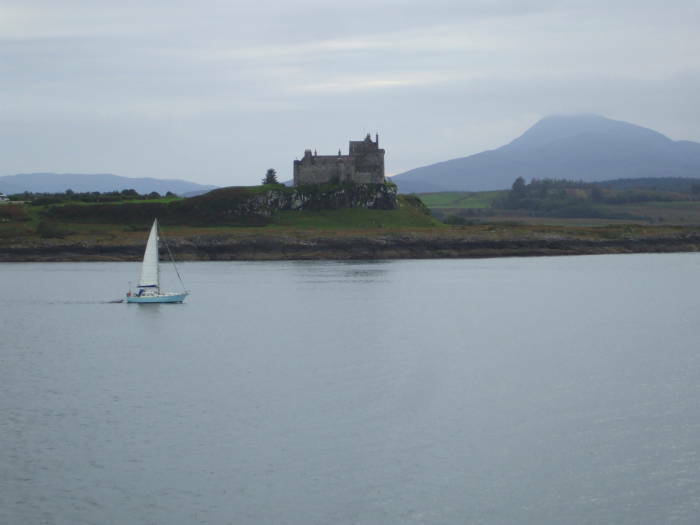 Duart is the ancestral home of Clan MacLean. The clan was supposedly founded by a Scots warlord named Gilleain na Tuaighe, who lived circa 1174-1249. There has probably been a fortress on this site of Dubh-Aird or Black Height since early medieval times. The current castle was probably built around 1250. The Great Keep of Duart was built by Lachlan about 1370. The Isle of Mull was taken over by the clan MacLean in 1493. They added to the fortifications in the middle and late 1500s and the late 1600s. Clan Campbell took over Mull in 1681, and the MacLeans abandoned Duart in 1691. The castle was occupied by government forces until 1751, and then it fell into ruin. It was restored in the early 20th century by Sir Fitzroy Donald MacLean. It was reopened in 1912 and has been the seat of the MacLean clan chief since then. According to some family history from a distant relative, my mother's mother's mother's father's father's mother was a MacLean, born in 1670 on Mull. As it turns out, this is not nearly close enough a connection to simply move into the castle. 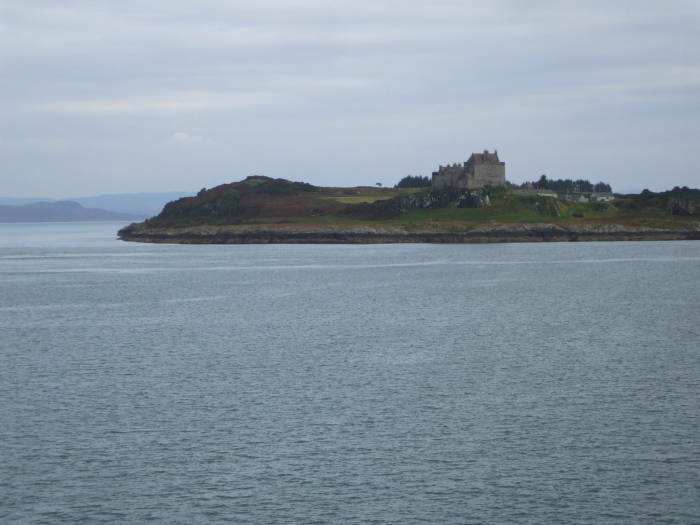 Shortly after passing Castle Duart you arrive in Craignure. From there a bus crosses the Isle of Mull from Craignure to Fionnphort in about 75 minutes. The scenery along the way can be anywhere from beautiful to invisible, depending on the weather. The single lane A849 road crosses Mull. There are just a couple of villages and a few scattered homes along the way. 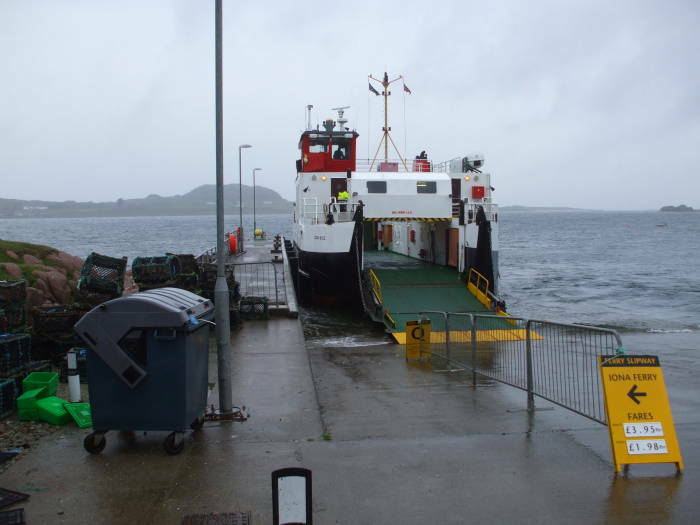 At Fionnphort you board a small ferry to cross the narrow sound to the Isle of Iona. It's just 1.5 kilometers across the sound. The ferry crosses constantly during the day, taking less than ten minutes for the crossing itself, and leaving each side every 35 minutes or so. There isn't a set schedule, it goes back and forth constantly, and until you get to the end of the day the next ferry departure will be within the next 40 minutes. Do make a note of the bus schedule back to Craignure — the crucial connection is to get onto a bus taking you back to the ferry port at Craignure.